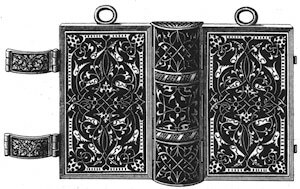 In his article, “On a Manuscript Book of Prayers in a Binding of Gold Enamelled, said to have been given by Queen Anne Boleyn to a lady of the Wyatt Family: together with a Transcript of its Contents”, published in Archaeologia, 44 (1873), Robert Marsham not only described the prayer book, he also transcribed its contents. My good friend, Olivia Peyton, has translated his transcription so that has modern English spelling and is therefore more accessible to readers today. Are we reading the words of Anne Boleyn? Did she write these prayers? Did she commission this book? We just don’t know. But whatever the truth and the origins of this book, its prayers and psalms are beautiful and I hope that you enjoy reading them. I thank thee, O Lord and King, and praise thee, O God my Savior. I will yield praise unto thy name for thou art my defender and helper and thou hast preserved my body from destruction, from the snare of traitorous tongues, and from the lips that are occupied with lies. Thou hast been my helper from such as stood up against me, and hast delivered me after the multitude of thy mercy and for thy holy name’s sake. Thou hast delivered me from the roaring of them that appeared on every side and there was no man to help me. I looked about me to see if there were any man that would succor me, but there was none. Then thought I upon thy mercy, O Lord, and upon thine acts that thou hast done ever of old, namely that thou delivers such as put their trust in thee, and removes them out of the hands of the heathen. Thus lifted I up my prayer from the earth, and prayed for deliverance from death. I called upon my Lord, the father of my Lord, that he would not leave me without help in the day of my trouble and in the time of the proud. I will praise thy name continually, yielding honor and thanks unto it, and so my prayer was heard. Thou saved me from destruction and delivered me from the unrighteous time. Therefore will I acknowledge and praise thee and magnify the name of the Lord. When I was yet but young, or ever I went astray, I desired wisdom openly in my prayer. I came therefore before the temple and sought her unto the last. Then flourished she unto me like a grape that is sun ripe. My heart rejoiced in her, then went my foot the right way, yea from my youth up, sought I after her. I bowed down my ear and received her. I found me much wisdom and prospered greatly in her. Therefore will I ascribe the glory unto him that gave me wisdom, for I am advised to do thereafter. I will be jealous to cleave unto the thing that is good, so shall I not be confounded. My soul hath wrestled with her and I have been diligent to be occupied in her. I lifted up my hands on high and then was my soul was illuminated through wisdom and I acknowledged my foolishness. I ordered my soul after her, she and I were one heart from the beginning, and I found in her purity. And therefore shall I not be forsaken. My heart longed after her and I gained a good treasure. Through her the Lord hath given me a new tongue wherewith I shall praise him. O come unto me, ye unlearned, and dwell in the house of wisdom, withdraw not yourselves from her, but talk and share of these things, for your souls are very thirsty. I opened my mouth and spake, O come and buy wisdom without money, bow your neck under her yoke and your soul shall receive wisdom. She is hard at hand and content to be found. Behold with your eyes how that I have had but little labor and yet have I found much rest. Receive wisdom and ye shall have plenty of gold and silver in possession. Let your minds rejoice in his mercy and be not ashamed of his praise. Work his works many times. And he shall give you your rewards in due season. O most merciful and ever good God of whose incomparable goodness we receive all things necessary that we lack, and of whose great grace we use that thing which we receive, so that at thy wholesome hand we both receive all such good things as we have, and the grace also to use our health and thus honor that thing that we receive, Grant us, most merciful father this one of the greatest gifts that ever thou gavest to mankind, the knowledge of thy holy will and glad tidings of our Salvation, this great while oppressed with the tyranny of thy adversary Rome and his followers, and kept close under his Latin lies, and now at length promulgated, published and set at liberty by the grace poured into the heart of thy supreme power of our prince (as all kings’ hearts be in thy hands), as in the old Law did use like mercy to thy people of Israel by thy high instrument the good king Josiah, which restored the decayed temple to its former beauty, abolished the worship of Images and idolatry and set abroad thy Law by the space of many hundreds of years before clean out of remembrance and knowledge by reason wherof he merited and deserved the renown and name of the best Prince that ever before reigned or should bear rule over Israel. Grant us, most favorable father which art want to give good gifts to thy children, this thy gracious gift granted by thee and received by our Sovereign ruler under thee, thankfully to receive and rightly to use to the glory of thy holy name and safeguard of our sinful souls. Grant us O Lord, at thy most holy word, to learn perfect and faithful obedience unto thee, and to our governances ordained by thee, grant us most merciful God to read it with all reverence and study it with all diligence, and in our loving to put it to use and experience, that not only our words but that also our works may lovingly express it, that we may not only learn it but also love it, that they which have no knowledge of thee may read in the loving book of our good conversation thy holy learning that they by our good example may be allured and enticed to thy holy Law. The servant, Lord, knowing his master’s will and not fulfilling it, shall be sore scourged and beaten. Alas, then, that ever we should be so far behind that the thing which is the very instrument of our salvation should, through our wickedness, heap on us death and damnation. Let that Lord be far from us, thy Servants, but as thou hast given us the gift of knowledge, so give us power to fulfill the thing that we know. And thou, Lord, which only hast the Key of David with which when thou openest, no man can close, and when thou closest, no man can open, which has hidden these high mysteries from great, worldly, wise men and has disclosed them to the poor, simple, meek and lowly ones. Grant us, Lord, an humble and meek spirit, utterly distrusting on our wits, and calling to thee for wisdom, which art thyself wisdom and author of all wisdom, and which gives it to all folks that ask it of the steadfast and with faith. Grant us, Lord, to use it as a light and a looking glass to spy and amend our own faults, rather than to check, taunt and rebuke other men. Grant us, Lord, to build ourselves upon the rock and stone of steadfast faith, to think and believe to be true, though our simple capacity cannot at first attain nor reach unto all things contained in thy most holy words, also that our senses be captive to thy holy will. Let us not Lord be too deep, curious ransackers of the mystery of thy divine Majesty, least we be oppressed of thy glory. But let us rather read it with humble reverence, than to wade too deep therein with subtle questions. Grant us, Lord, not to mistake nor misunderstand thy holy word. Let not that, Lord, which should be a lantern to our paths and a light to our steps, be a stumbling block to our feet and, through our corrupt and lewd understanding, occasion of dark errors and heresy. O corrupt and venomous nature of mankind, which of lightness searches out darkness, of health, sickness, of honey, venom and of life, death, the false Lord is not in thee, nor in thy holy word, but in our fleshy judgment and birth poison which Lord, through thy holy spirit made of foul, clean, of dark, clear, of wrong, right, of flesh, spirit that we may sincerely, purely and rightly read, perceive and understand thy holy testament and last will confirmed with thy death and sealed with thy precious blood, and be true, faithful administrators thereof, that at the last we may have that thing which therein is bequeathed us that believe, love and labor in thy commandments, that is to say, everlasting life. Grant, Lord, unto our most gracious governor and king, that as he hath graciously begun and henceforth hath, through thy mercy, had prosperous success in setting forth thy holy word, a service no less acceptable unto thee than profitable unto us, that he may virtuously prosper in the same, and victoriously to achieve this, his high and godly enterprise, to the utter abolishment of the Antichrist and all his sects, and after this temporal Crown here, he may have an everlasting Crown which is due by thy promise to all such as so valiantly defend thy faith. The Lord is long, nor he be angry, full of mercy, and suffers iniquity and sin, and leaves no man innocent, and visits the unrighteousness of the fathers upon the children in the third and fourth generations. Be merciful, I beseech thee, unto the sins of this people according unto thy great mercy, as thou has forgiven thy people from Egypt even until now. O Lord, almighty God of our fathers Abraham, Isaac and Jacob, and of the righteous of them which hast made heaven and earth with all the Ornament thereof which hast ordained the sea by the word of thy commandment, which has shut up the abyss and hast sealed it, for thy fearful and laudable name dread of all men, and honorable before the face of thy virtue, the fierce anger of thy threatening is important, heavy to sinners. But the mercy of thy promise is great and unsearchable, for thou art the Lord God most high above all the earth, long suffering and exceedingly merciful, and repentant for the malice of all men. Thou, Lord, after thy goodness, hast promised repentance of the remission of sins, and thou that art the God of the righteous hast not put repentance to the righteous Abraham, Isaac and Jacob, to those that have not sinned against thee. Verily, Lord, I have sinned more in number than the granules of the sea and mine iniquities are multiplied. I am made crooked with great bonds of Iron, and I have no comfort not so much as to draw my breath because I have provoked thy unpleasant wrath, and have done the thing that is evil before thee, setting up abominations and multiplying my offences. And now I bow the knees of my heart, seeking mercy of thee. Oh, Lord, I have sinned. Oh, Lord, I have sinned and I acknowledge my iniquity. I ask thee, O Lord, I beseech thee, O God, forgive me, destroy me not together with my iniquity, neither rescue those evils to me eternally, for though I be unworthy, yet save me according to thy great mercy and I will praise thee all the days of my life, for all the powers of the heavens praiseth thee, and thine is the glory unto the world of worlds. O Lord, Lord thou valiant and almighty king, for all things are in thy power, and if thou wilt help and deliver Israel, there is no man that can withstand or let thee, for thou hast made heaven and earth, and what wondrous thing so ever is under the heavens. Thou art Lord of all things, and there is no man that can resist thy majesty, O Lord. Thou knowest all things thou wouldst, Lord, that it was neither malice nor presumption, nor for any desire of glory that I would not bow down myself nor worship yonder proud, presumptuous Haman, for I would have been content and that with good will if it might have done Israel any good to have kissed even his footstep, but that I did it because I would not set the honor of a man instead of the glory of God, and because I would not worship none but only thee, my Lord. And this I have done in nor pride nor presumption. And therefore, O Lord, thou God and King , have mercy upon thy people, for they imagine how they may bring us to naught, yea their mind and desire is to destroy and overthrow the people that have ever been thine inheritance of old. Despise not this portion which thou hast delivered and brought out of Egypt for thine own self. Hear my prayer and be merciful unto thy people whom thou hast chosen for a heritage unto thy self. Turn our complaint and sorrow into joy that we live, O Lord, and praise thy name. Our Lord suffers not the mouths of them that praise thee to be destroyed. O Lord, thou father and God of my life, let me not have a proud look, but turn away all voluptuousness from me. Take me from the lusts of the body, let not the desire of uncleanliness take hold upon me, and give me not ever into an impertinent and obstinate mind. Plead thou my case, O Lord, with them that strive with me and fight thou against them that fight against me. Lay hand upon the shield and buckler and stand up to help me. Bring forth the spear and stop the way against them that persecute me, say unto my soul, I am thy salvation. Let them be confounded and put to shame that seek after my soul, let them be turned back and brought to confusion that imagine mischief for me. Let them be as the dust before the wind and the angel of the Lord scattering them. Let their way be dark and slippery and let the angel of our Lord persecute them, for they have privy laid their net to destroy me without a cause, yea even without a cause have they made a pit for my soul. Let a sudden destruction come upon him unawares, and his net that he hath laid privy catch himself into his own mischief. And my soul be joyous in the Lord, it shall rejoice in His Salvation. All my bones shall say, Lord, who is like unto thee which delivers the poor from stronger than himself, yea the poor and him that is in misery from him that spoil him. False witness did rise up, they laid to my charge things that I know not. They rewarded me evil for the good, to the great discomfort of my soul. Nevertheless, when they were sick, I put on sackcloth and humbled my Soul with fasting and my prayer shall turn into my own bosom. I behaved myself as though it had been my own friend or brother. I went heavily, as one that mourns for his mother. But in my adversity, they rejoiced and gathered them together, yea, the very abject came together against me unawares, making moves at me and ceased not with the flatterers, who were busy mockers, which gnashed upon me with their teeth. Lord, how long will thou look upon this? O deliver my soul from the calamities which they bring upon me and my darling from the lions. So will I give thee thanks in the great congregation. I will praise thee among many people. Let not them who are my enemies triumph over me, neither let them wink with their eyes that hate me without a cause. And why their communing is not for peace, but they imagine deceitful works against them that are quiet in the land. The gaped upon me with their mouths and said, Fie on thee, Fie on thee, we did see it with our eyes. This thou hast seen, O Lord, hold not they tongue then, go not far from me. O Lord, awake, stand up to judge my quarrel, avenge thou my cause, my God and my Lord judge me, O Lord my God, according to thy righteousness and let them not triumph over me. Let them not say in their heart, There, there, so would we have it, neither let them say, We have devoured him. Let them be put to confusion and shame together that rejoice at my trouble. Let them be clothed with rebuke and dishonor that boast themselves against me. Let them be glad and rejoice that favor my righteous dealing, yea, let them say, Always blessed be the Lord which hath pleasure in the prosperity of His servant. And as for my tongue, it shall be talking of thy righteousness and of thy praise all the day long. O merciful God, grant me to covet with an ardent mind those things which may please thee, to search them wisely, to know them truly, and to fulfill them perfectly to the laude and glory of thy name. Order my living so that I may do that which thou requires of me, and give me the grace that I may know it, and have will and power to do it, and that I may obtain those things which be most convenient for my soul. Good Lord, make my ways sure and straight unto thee, so that I fail not between prosperity and adversity, but that in prosperous things I make thee thanks, and in adversity to be patient, so that I be not left up with the one, nor oppressed with the other. And that I rejoice in nothing but that which moves me to thee, nor to be sore for nothing but those things which draw me from the desire to please no body, nor fearing to displease any besides the Lord, let all worldly things be vile to me for thee. And thou, Good Lord, most specially above them all. Let me not be merry with the joy that is without thee, and let me desire nothing besides thee. Let that labor delight me which is for thee, and let all the rest weary me which is not in thee. Take me to lift up my hand often times to thee, and when I fall, make me to think on thee and be sorry with a steadfast purpose of amendment. My God, make me humble without feigning, merry without lightness, sad without mistrust, sober without dullness, true without doubleness, fearing without desperation, trusting in thee without presumption, telling my neighbors’ fate without dissimulation, teaching them with words and examples without mocking, obedient without arguing, patient without grudging, and pure without corruption. My most loving Lord and God, give me a waking heart that no curious thought withdraw me from thee. Let it be so strong that no unworthy affection draws me backwards, so stable that no tribulation breaks it, and so free that election by violence make any challenge to it. My Lord, grant me wit to know the diligence to seek the conversation to please thee, and finally hope to embrace thee for the precious blood sake of that immaculate lamb, our only Savior Jesus Christ, to whom with the Father and Holy Ghost, three persons and One God, be all the honor and glory, world without end, Amen. I believe, Lord, increase my faith and help my unbelief that I be not thrust down and drowned with this affliction. O most merciful and gentle Father, thy mercy is above all thy works. O Lord, the God of my Salvation, my defender and succorer, enter not into judgment with this servant. Christ is my righteousness, redemption and innocence which suffered most cruel and bitter death for me, but thou, O Father of mercy, moved for this thy Son. Christ’s sake have mercy on me, and stabilize and strengthen my heart with faith in Christ, and comfort me with the comfort of the Holy Ghost that I may have true joys in Christ for evermore. O Father comfort our conscience both now and in the day of death, which conscience is now abashed seeing its sin and iniquity and then also shall be abashed remembering thine hard and straight judgment. Give this peace into our hearts that we rejoicingly may look for thy judgment. Enter not into judgment against us with the straight extremity of thy Law, for in it no man shall be found innocent and righteous, but in many ways to have sinned against it. Teach us, dear Father, not to stay or ground ourselves in our good works or deservingness but to give and submit ourselves plainly and faithfully to thine infinite and incomparable mercy. Follow not the steps of the evil, neither envy thou the prosperity of evil doers. For suddenly like hay are they cut down, and like the green grass be they withered. But thou, see thou trust in the Lord and do good, that thou may dwell upon the earth and he may well feed thee. And thou shall delight in the Lord, which shall give thee thy heart’s desire. Lay for thee thy way before the Lord and trust unto Him, for he shall set for thee thy good deeds like the morning, and thy just dealing like the midday. Give thyself wholly unto the Lord and abide His pleasure, let not a life move thee whom all things prosperously succeed, even that man which liveth all in sin. Remit wrath, forswear anger. Let not their evil example provoke thee to do evil. For evil doers shall be cut away, but they that patiently abide the Lord’s pleasure shall possess the land. Suffer a little while, and the ungodly shall be clean gone, when thou shalt look for his place, he shall not appear. But the meek spirit shall possess the land and enjoy much peace. The ungodly layeth in wait for the just, and grinneth upon him with his teeth. But the Lord laugheth him to scorn, for He sees when his day shall come. The ungodly draw forth their sword and bend their bow to throw down the poor afflicted and to kill them that go the right way. But their own sword shall pierce their own heart, and their bows shall be broken. That little of the righteous is better than the great goods of the ungodly. For the armies of the ungodly are consumed, but the just men the Lord strengthened. The Lord also knows the days of the innocents, for their heritage is perpetual. They shall not be shamed in the perilous time, but in hunger they shall be sated. But the ungodly shall perish and the enemies of the Lord shall be consumed with fire, their smoke flying up like the smoke of burned, fatted rams. The ungodly borrows and gathers his goods by usury, never to repay or give, but the just give forth liberally. Who so approves this liberality, they shall possess the land, but they that abhor it shall be rent up by the roots. In the Lord are the steps of a good man directed, and he loves His way. When he falls, he shall not be hurt, for the Lord sustains him with His hand. I was a child and now I am old, and never saw I the just forsaken or his seed seek his bread, although he would ever be giving forth alms, and for this cause his seed enjoyed his goods prosperously. He flees ill and follows good, and he dwells here many days. For the Lord loves just dealing, and does not forsake his saints, but they are kept forever, but the seed of the ungodly will be cut away, but the just shall possess the land and shall dwell long thereupon. Wisdom is ever in the mouth of the just, and his tongue speaks equity. For the law of his God is in his heart, wherefore his ways be firm and fast. The ungodly looks narrowly on the just and hunts to slay him. But the Lord leaveth him not into his power, nor condemns him when he is judged. Trust in the Lord and keep His ways and He shall exalt thee to possess the land and that thou may see the destruction of the ungodly. I saw on a time the ungodly rooting and strongly settling himself and rising up, flourishing like the green bay tree, but lo, in the twinkling of an eye he was gone, and when I looked for his place it could not be found. Keep innocence and behold the right, for these things at last shall procure a man peace. Then the transgressors shall be banished away together, for the end of the ungodly is death and destruction. But the health of the just comes from the Lord, for it is He that is their strength in the article of distress. The Lord brings them help and delivers them, He defends and saves them from the ungodly because they trust in Him.